Jam-packed with disease-fighting antioxidants, cranberries add a tangy flavor to all sorts of Thanksgiving dishes, from dessert to stuffing to savory sauce. 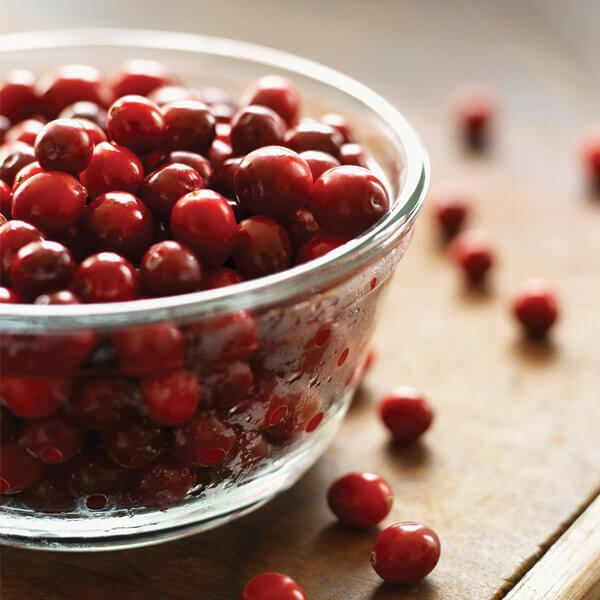 Add zest to your Thanksgiving menu with one of these tart-and-tasty cranberry recipes. Cranberries offer a tart-and-tangy way to liven up your traditional cornbread dressing. Just to ensure this becomes everyone’s favorite, our Cornbread & Cranberry Dressing recipe calls for bacon, too. Need we say more? Fresh or frozen cranberries are combined with red wine, cherry juice, allspice berries, carrots, onions and spices to create a flavorful sauce and an aromatic complement to your roasted turkey. This cranberry dessert recipe calls for fresh or frozen cranberries, sugar, butter, crystallized ginger and orange zest. Gingersnap cookies form the scrumptious crust. Fresh cranberries have a relatively short season, from September through December. If you like cooking with whole, fresh cranberries, your best bet is to buy extra bags of them when they’re in season and just throw them into the freezer. When buying fresh cranberries, look for plump, deep red berries that are firm to the touch. To cook fresh cranberries, heat them just until they pop—overcooking can make them bitter. In a study comparing the nutritional value of 19 common fruits, cranberries came out on top, with the highest concentration of antioxidants. One type—proanthocyanidins—helps prevent urinary-tract infections by stopping bacteria from adhering to bladder walls. Native to North America, cranberries grow on low-lying vines in sandy fields called bogs. Most domestic cranberries are farmed on about 40,000 acres in five states: Massachusetts, New Jersey, Oregon, Washington and Wisconsin. Americans consume more than 350 million pounds of cranberries per year—about one-fifth of them at Thanksgiving.